"Isabelle, get up! Your cousin is going to be here in one hour." Mom said. I groaned and got out of bed, Mom and Dad were going to Alaska for their anniversary and I had to stay at my cousin's while they were away. I did not want to go to Skyler's farm, she is my cousin who lives two hrs. away. At least I could bring one horse with me! That was the best part of all. I grabbed my pillow and my backpack with all of the things I would need for three weeks. The sun was up and I ran down the stairs nearly banging into mom. "Isabelle did you get everything?" Mom asked. Skyler would be here any minute so I ran to get my horse and the supplies for my horse. "Good morning Sugar." I said. She greeted me with a friendly whinny. Dad grunted and waved from the office. Ever since we moved to Wisconsin, Dad had been so busy with phone calls and paper work. I heard a car pull up and a horn honk. "Great, Skyler is here." I muttered. I led Sugar out of her stall and into the trailer. Uncle David greeted me and Skyler just stared at the ground. "Bye mom! Bye dad!" I yelled. They replied my goodbyes with kisses and hugs, I was sure my cheeks turned red. I hopped in the car and tried to talk to Skyler but she just looked out the window. The grass blurred as the car drove by. I leaned against the door and fell asleep. We finally arrived at their house. Aunt Terresa greeted me and gave me a big hug. Three or four dogs barked and ran up to me. Skyler got out and helped me unload Sugar and take her to a stall. I got her settled in and then went into the house. Aunt Terresa said to me, "You and Skyker will be sharing a room while your here, I hope you don't mind!" "Not at all," I nearly whispered. Being the only child meant that I always had my own room and got everything to myself but now I wasn't so sure how it would be. Skyler helped me settle in she barely talked at all and stayed on her side of the room. I finally went outside and that is when I saw a beautiful Stallion in the distance. He reared and galloped away. Skyler said," He's beautiful isn't he?" I was surprised she said anything but I only nodded not wanting to speak. Aunt Terresa told me that there were riding lessons for Skyler and I could join if I wanted. They started at 3:00 every Monday, Tuesday, and Friday. Saturdays were show practices for a competition. I decided to enter. At 3:00 a lady showed up with ten other girls and explained that they were there for the lessons also. I saddled up Sugar and warmed her up around the arena. One of the girls said, "You must be new good luck with you competing." Please comment about Part 1 and tell me what you think!! Part 2 coming soon!!!! You have a gift and the writing ability of someone well beyond your years! Keep writing and I'm excited to see how this story goes! Good job! please write more. Lots of detail. Claudia I did read your story! It was really good! I also commented on it! I absolutely love the story so far. There is so much detail and it's fun to read. You have a lot of talent in writing. I love it! I like Isabelle already. You provide just enough detail to keep me interested yet not too much so I want to read more. That is the trick to writing and you've got it. Can't wait to read pet 2. This is my favorite age group in writing. I am guessing age but would like to know. I have a feeling you will be revealing that later. Great job! Like the first person and dialogue. Please read my story! Your story is awsome! As the title says, please read my story! Aroura, the Appaloosa! Your story is absolutely stunning! Keep on writing! Lots of detail! I love the way everything is in detail! Maybe just tell the ages of the characters, and how they look! Also if you want, just a touch of romance! You have talent! Love the characters name! Can you please read my story too and comment? It's " Aroura, the Appaloosa"
The riding lessons went well, but one girl was green with jealousy. I had no idea why she was jealous, I mean she has the best horse, with the best gear, clothes, and hair-do. Our teacher was giving me thumbs up and and praising me. I cooled Sugar off and led her to the barn. As I went I heard someone say, "Hey, Skyler, maybe you can sleepover at my house Friday?" "I need to ask my mom," Skyler replied. I hoped I would get invited too. Then Skyler surprised me and asked, "Can my cousin come too?" She was so awesome! I couldn't believe it: my cousin actually asked if I could go to a sleepover! "Yeah, sure I have room, my mom said to ask you," said the girl." By the way my name is Caroline." This was going to be the best vacation at my cousin's ever! I hoped Aunt Terresa would say yes. I hugged Skyler then put Sugar in her stall. Skyler and I skipped inside, Aunt Terresa was waiting inside. I nudged Skyler and she asked, "Mom, Caroline asked if Isabelle and I could sleepover, can we, it's on Friday night?" "Sure you can girls." Aunt Terresa answered. I was so happy that I skipped outside and just went to the barn. I heard neighing outside and went to check it out. The stallion was there, I grabbed an apple and went out to try to get him closer. "Here boy, I am not going to hurt you." I called. He came closer and I stood still , the stallion came and took the apple gladly. 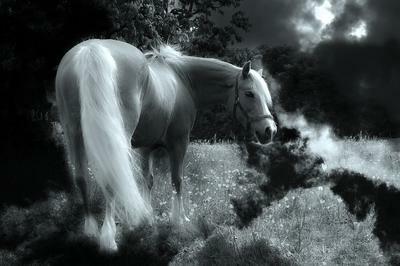 Skyler was coming and the stallion reared twice and galloped off into the woods. "Sorry, I didn't mean to scare him." Skyler said quietly. "I know, it's okay." I replied. We went into the barn and talked. Dinner would be ready in an hour and Skyler was taking care of her horse. Sugar snorted in my long brown hair. I hugged her and groomed her white coat until it shined. "Dinner!" Aunt Terresa called. Skyler and I ran into the house. We were starving. I really enjoyed reading your story. It was very well written. You are very talented! I can't wait to find out what happens next! I can't wait for the next part! Keep up the good work. Dinner was good. I stayed to help with the dishes, and Skyler went to check on the horses. Skyler yelled for me to come, so I did. I thought something happened to her. She motioned for me to stand by her, that is when I saw the wild herd of horses. There were at least 30 horses and they were so pretty! Skyler nodded. Then I saw the black stallion, he is the leader of the herd Suddenly they all took off into the woods. "Time for bed!" Aunt Terresa called. Skyler and I hurried to get ready for bed. I got into my PJ’s and got in bed. Aunt Terresa came in to say goodnight and give Skyler a hug. I stared at the ceiling of the room, there were glow in the dark stars on the ceiling. The next thing I knew it was morning. The smell of bacon, eggs, and pancakes wafted into the room. It made my stomach growl and mouth water. I glanced at Skyler and we both smiled. "Well, it looks like it is time to get up!" Said Skyler. We got up and dressed. "Good morning girls." Aunt Terresa said. "Good morning." We replied in unison. I grabbed a plate and got eggs, bacon, and orange juice. It all tasted so good! I hurried to feed Sugar and take her for a morning ride. Skyler came too. Sugar greeted me with a friendly whinny and I got her oats ready. She ate and I waited a little before I saddled her up. Skyler and I went out to the field and raced one another. I slowed Sugar to a trot and went in circles. Sugar stopped and twitched, her ears moved forward and backward. I heard a faint whinny from the woods. The black Stallion galloped from the woods. There were two men, on horses, chasing after him. I galloped on my horse to the two men. Skyler came right behind me. "Stop!" I yelled. The men looked at me, and as I got closer I noticed it was actually a boy and his brother. The younger smirked. Skyler nudged me. "Hello! That is my brother!" She replied. I had no idea which boy was her brother, all I knew was that they were trying to catch the Black Stallion. "I'm Nate, and I'm Skyler's older brother." Said the one on the paint horse. I smiled nervously, and glared at Skyler. She looked away. Nate studied me and looked at Skyler, confused. "I'm Isabelle, your cousin." I said, trying not to raise my voice. "Why were you trying to catch the Black Stallion?" I asked. "We were trying to catch him so we could sell him." Said the younger boy. If they were going to sell him, I was going to buy him. I could feel my temper rising. Skyler turned her horse and left. "Well, thanks, see you later Nate." I managed to say it sweetly. I turned my horse and left, relieved that the Black Stallion left safely. I got to the stable and Skyler was nowhere in sight, I would talk to her later. I unsaddled Sugar and put her in her stall, making sure I gave her a treat before I left. "Isabelle, you have a phone call!" Aunt Terresa called. I hurried to the house and Aunt Terresa handed me the cordless phone. "Hi, honey, it's me, mom." "Good. I miss you guys." "It's beautiful! We are really enjoying it." "Well I gotta go, Mom." "Okay, bye and be good Isabelle." "Bye, mom, tell dad I said hi." Our conversation ended and I handed back the phone. It was time for lunch so I helped set the table. Aunt Terresa called everyone in and took a seat between Nate and Skyler. "Hey Mom, Dad, guess what." said Nate. "What?" They asked in unison. "Josh and I caught this beautiful black stallion in the woods today. We plan on selling him so I can pay the rent for my new apartment." He replied. "You gonna split the money you get?" Asked my uncle in his deep gravelly voice. At that moment I gasped, really loud. Skyler looked at me and I looked at Nate. "Where is he?" I had to ask. "At Honeystar Stable, where I work." He said. "How far is it? By horse?" I asked. "Oh, maybe 20 minutes to a half an hour." I knew where it was, I would just need to figure out how to get there. I would need Skyler's help. I wanted to free him. If he was sold, he could be sold anywhere and to anyone. If I couldn't free him I would hopefully buy him. Plan A & B were in progress. Author's Note: Sorry I didn't write it sooner! I hope you like the story. Part 5 coming soon! I helped clean up and wash the dishes. Aunt Terresa smiled and said I didn't have to help, but I insisted. Skyler avoided me but I got her to talk. "What's wrong, Skyler?" I asked kindly. "Well," she hesitated." I'm mad at my brother." "He is always trying to be 'perfect', he left the house last year and now it seems so empty." She took a deep breath," And I miss him so much it almost hurts." "Doesn't he visit often?" I asked. "Mostly the holidays and birthdays, but he rarely comes to visit. He would visit once a week, he promised me, but now he doesn't seem to remember and he always has an excuse. Also, he's going to college in a few months and I really will miss him!" "Oh," I said softly. "Well, I am here for little so lets at least have fun together." "Okay." She replied with a small smile. We went to the barn and I brought some stuff. Skyler grinned at me and I smiled back. Aunt Teressa smiled at both of us. Skyler asked, "Hey, mom, can we have some sandwiches, water bottles, and some snacks?" "Sure girls, I'll call you when it's ready." Aunt Teressa replied. She secretly winked at me. I had no idea what my cousin was up to. Skyler grabbed my hand and ran to the barn. Her smile vanished. The barn was a mess, everything was thrown on the floor and the horses were spooked. I ran to the house while Skyler checked the horses. "Aunt Teressa!" I yelled. "Come quick, someone messed up the barn!" She came and said it wasn't that big of a deal, as long as nothing was stolen. She also said that some neighbor boys would do that. Skyler dashed out the door, and I ran after her. She was chasing a younger boy! I caught up and we grabbed him, took him to the barn, and made him confess. "Tell us, young man, did you make this mess?" Asked Aunt Terressa. He looked at the ground, "Yes, I-I did." He looked up with guilt washed over his face. " I'll clean it up." "Yes, you will clean it up," Aunt Teressa said sternly, "girls, stay here and watch him carefully, please." "So, what's your name?" She asked looking straight in his blue eyes. "Tyler...Tyler Black." He replied as he picked up a saddle. "About two miles up the road." I like your characters and plot. You're a good writer; keep it up! I would love to read more! Keep it coming! Have you checked out my story "America"? Please comment and tell me if you want more! Great job Rebecca! I look forward to reading what happens next. Hopefully you'll have plenty of time to write this summer! I absolutely love it! Please write part 5! Anxious to hear what happens!!! Keep writing!!! Great job! Keep writing. Love the the detail. Keep up the great work. Hey everyone, Please comment and tell me if you want more! If you want more comment and tell me what you think! Thanks. I really love it!!! Part 5 please! More please! What happens to the Black Stallion? Please comment if you want more!!! Tell me what ya'll think! Thanks! !